I am quite certain there will never be another Kilday Thanksgiving quite like this one. A regular work day and a regular school day. A day when Thais leaves at 6 am for cross-country travel to meet with survivors of modern-day slavery. 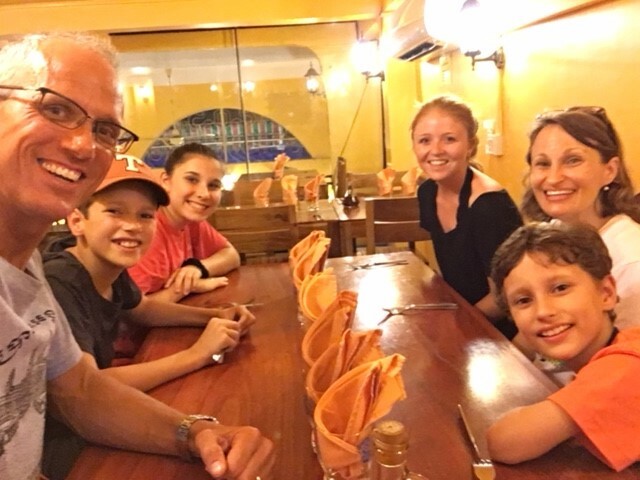 A day when we find a Phnom Penh eating establishment that serves both American-style Thanksgiving dinner and pizza. 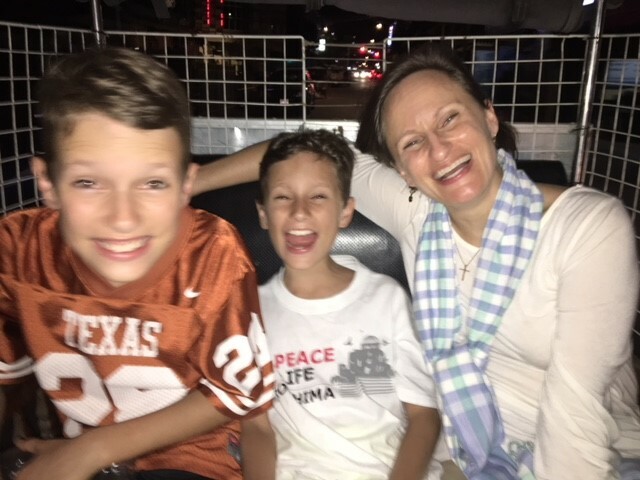 A day when our post-dinner tuk tuk ride home takes us across the open sewer canal that runs through the heart of the city. A day when our driver warns us on the way home about the known robber-on-a-moto straight ahead, so please secure your phone and personal items. And a day when at least one of us will be up late baking cookies in our tiny five-cookies-per-pan microwave/convection oven for Naeda's school formal fundraiser. Not your typical Thanksgiving Day. 1. Our IJM-Cambodia legal team has a 100% success rate through eight trials this year, with 18 convictions against those involved in human trafficking. Praise God! 3. We are thankful for the heroes we have met at IJM and the transformational work they are doing to end modern-day slavery. It has been such a privilege to be a small part of this group that is working to change a broken part of a broken world. 4. We are grateful for friends we have missed all year long and we will soon see. And we are grateful for new friends we will treasure always, that we will soon miss. 5. We have been blessed to host friends and family from the U.S. throughout the year, which has been a great source of joy and encouragement. Recent visitors have included Audrey Doak (late September); Ashley Ellison, Jennifer Maham, and Meredith Weatherby (early/mid October); and my parents, Bill and Genie Kilday (late October through mid-November). Thanks so much to all of you for coming! Dinner with Audrey Doak at Luigi's Pizza -- a local favorite. 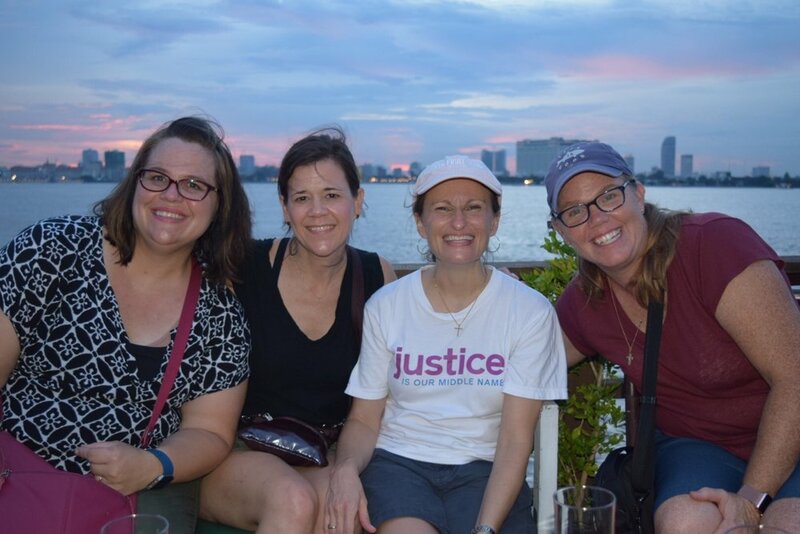 Jennifer, Ashley, Thais, and Meredith on a Mekong River sunset cruise. 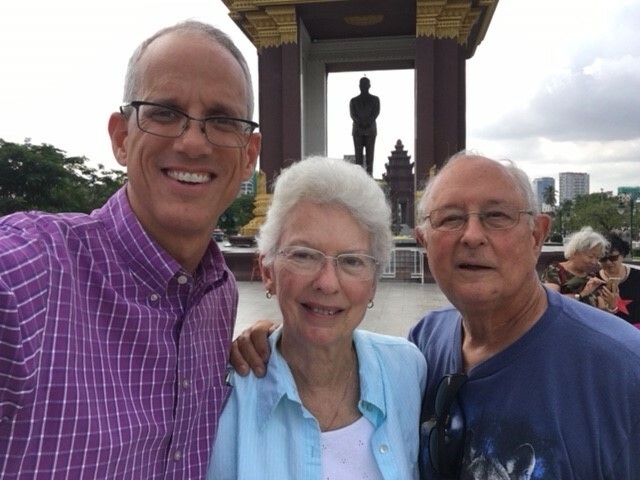 My parents (a/k/a Mimi & Pop) at Independence Monument and the King Norodom SIhanouk statue. 6. We are grateful that Cambodian mangoes -- one of our favorite treats of the whole year -- are back. 7. We now have a massive and loud construction project right outside our apartment window, ten stories down. While we are most assuredly not thankful for the near constant noise, we are thankful that they waited until October before starting. We are also enjoying the daily live entertainment. There's nothing quite like watching a high-rise building being built by men wearing hardhats and flip-flops. 8. We are thankful for noise ordinances back home. Oh, and also for weekends, especially of the quiet variety. The grinding and clanging of heavy machinery right outside our window starts at 6:00 am, and it usually continues well past midnight. Seven days a week -- yikes! 9. We are thankful that the Houston Astros won the World Series. But why do we call it the "World" Series? We have learned here that much of the world laughs at Major League Baseball's presumptuous and curious choice of nomenclature. 10. We are thankful for Hope International School, and the good and kind people our kids have met there. What a great collection of students -- from 30 different countries! -- and nurturing teachers. We were so lucky to find this place. 11. We are grateful for the rain. We love way it cools and cleans this sweltering city while also bringing life and nourishment to the whole region and its food supply. The rain is good. 13. We are grateful for books, and time to read and enjoy them. I've probably read more books this year than in the prior five years combined. 14. We are thankful for the many things we have taken for granted. There are the obvious conveniences that we've missed having this year -- the dishwasher, an oven and a grill, the clothes dryer, a car. Then there are the things we didn't even realize we were taking for granted, such as clean air, electricity that consistently stays on, drinkable tap water, and a toothbrush we're not sharing with ants. But it cuts much deeper. We knew the numbers from IJM before we came -- 46 million people living in slavery, and four billion living outside the protection of the law. But now we better understand what that means. The numbers have become people. We have looked them in the eye. We have shared meals with them. We have heard their stories. We have fought for their rights. And it is all so much more real. 15. There is much work to be done. We are thankful that we serve a God "who is able to do immeasurably more than all we ask or imagine." (Ephesians 3:20.) Because we are asking for a whole lot. And we will keep on asking. Please join us. We wish all of you and your families a blessed and joyous Thanksgiving.